It’s a new year (happy new year again to everyone), so I decided it was time for a fresh start with a lot of things. The first of these things was my website. I put a lot of work into the old template, but no matter what I did, it just seemed so cluttered and less than professional. I started searching for a new template for WordPress and came upon the templates at Graph Paper Press. 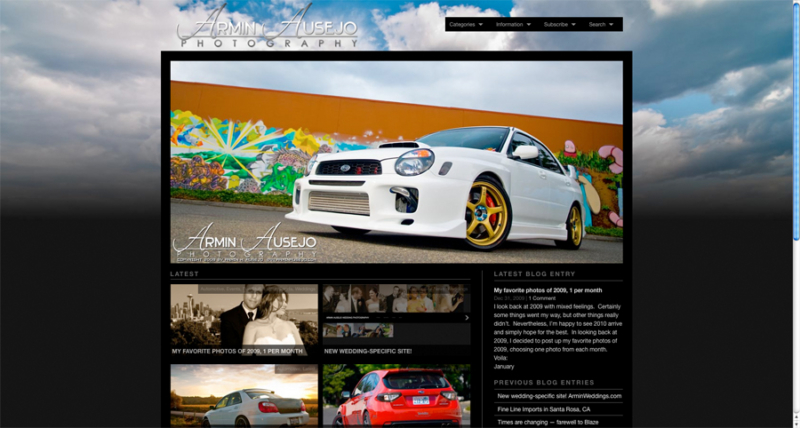 I ended up using their “Full Screen” template for ArminWeddings.com, and now I’ve moved forward to using their “Modfolio” template for this website, with a few tweaks of course. All of their templates are pretty well documented and I had this up and running in almost no time. In the process, I also figured out my problem with uploading images directly to WordPress, so it was yet another good thing to come out of this. I plan to update my blog here more often even if I don’t have photos to post up, so please keep checking back. Until then, enjoy the new site!